Spend your yuletide with the greatest stars of radio's Golden Age! Trim the tree, wrap the presents, and deck the halls as festive broadcast favorites like Jack Benny, Burns & Allen, Abbott & Costello, and The Great Gildersleeve keep you entertained! 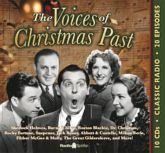 Hark to the voices of Christmases past - including Frank Sinatra and Will Rogers, Jr. - as they bring you merry mysteries and endearing dramas. Sherlock Holmes and Boston Blackie are on the case; Family Theater brings food for thought; a host of comedians, detectives, and western heroes all step to the microphone to send your family the warmest Season's Greetings!